Feche os olhos e imaginar o Sr. Crusoe sentado em uma pedra nesta praia de areia branca! Encontra-se em frente deste condomínio fechado, um dos melhores acomodações de Cabarete do. Ele teria gostado de trocar de lugar com você. Você vai encontrar um apartamento com tanto espaço amplo sala de estar e um quarto confortável. Olhe as fotos abaixo e só acredita no que vê. Na vida real este retiro é ainda melhor, em seguida, essas imagens. Você mora aqui cercado por tranquilidade, você abre as portas do pátio de uma rica variedade de plantas ... vamos chamá-lo o que é: um exuberante jardim tropical. O apartamento vem com quase tudo que você precisa. Aproveite ... desfrutar ... desfrutar ... ... E você verá que você quer ficar para sempre! The condo met all our expectations and was a great location/base to explore the region. The condo had everything needed for our two week stay. Plenty of choices for restaurants; nearby and within walking distance (pizza, pasta, bbq, vegan and fine dining). Beach is a little rough for swimming but there are nice ones within a short walk, or taxi to Cabarete/Sosua. Condo grounds are well maintained and secure. Condo management are attentive and easy to contact if need be. Thanks Thomas! 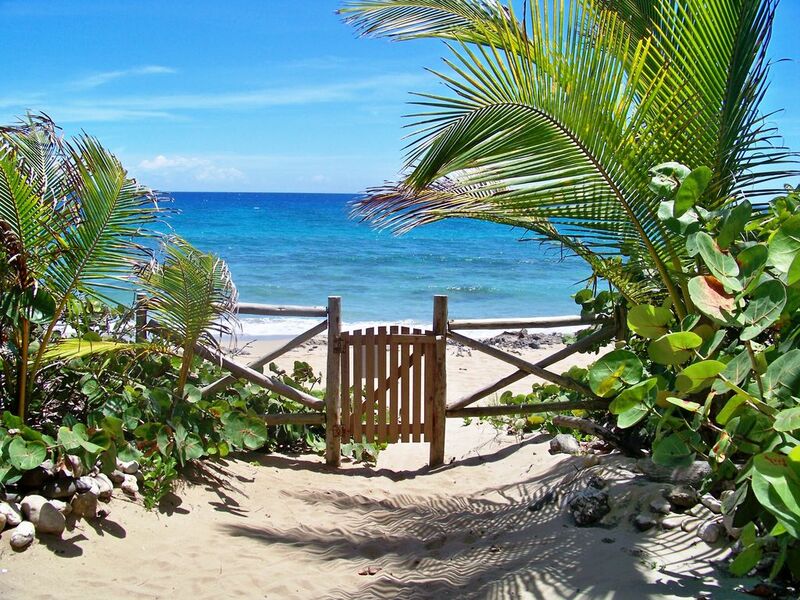 Cabarete is a short taxi ride away where you'll find your share of restaurants, nightlife and vendors. If kite or wind surfing is your thing, then Cabarete is a good place for you to spend your days. Locals are very friendly, and knowing a little spanish works to your advantage. Great place, we'll be coming back! This 1 bedroom unit is on the first floor and just a few 100 yards from the water. It is at the end of Perla Marina and a perfect location if you're interested in getting away from the noise. Our host had organized transportation for us at the airport and met us at the supermarket. Amazing hospitality and always available to answer any and every question we had. He was able to guide us on the best places to eat and most affordable options for transportation. Every morning we spent it with a freshly brewed cup of coffee and breakfast on the balcony overlooking the pool and what felt like our private tropical rainforest. We had air conditioning in the bedroom which made a world of a difference each night. The security guards were posted all over Perla Marina and were very pleasant. For our first trip out to the country, we felt incredibly safe and welcomed by all those residing there. We spent a lot of time in Cabarete for Kiteboarding and enjoyed being able to get away from the city nightlife at the end of each day. We couldn't have asked for a better place. -Iguana Mama and the 27 waterfalls tour - It will change your life! -Público for local transportation to either Cabarete (25-30 pesos) or Sosúa (30 pesos) off of the main road 5. We cannot wait to come back and visit this paradise. The location is perfect. It is between the town of Sosua and Cabarete, and a half mile from the main road. It's a beautiful walk in a great neighborhood, Perla Marina. The beach is fairly private and never crowded. The property managers, Thomas and Yajaira, were wonderful. We encountered several incidents at the beginning of our stay, nothing major, but never the less, quickly attended to by Thomas and his lovely wife. We stayed for two months and felt very much at home. Our unit had a beautiful view of the pool and gardens. Everyone we encountered were gracious and friendly from the pool caretakers to the security guards. We could here the ocean waves from our unit; however, I would prefer to feel the ocean breeze from the balcony. We didn't rent a car, didn't feel a need to. We used the public transportation and never had to wait very long. We rarely went out at night, but when we did we used the taxi service. In the apartment there is a book with helpful suggestions about the area, the business cards of recommended restaurants and cab drivers, tour companies, supermarkets, etc. We hope to return again to the area next year. Gorgeous view of grounds and pool. This 1BR is a ground floor unit set back a short walk from the ocean. It overlooks the gorgeous pool and seriously beautiful landscaped grounds. The pool area is quiet, and the complex is small. It is an oasis of tropical plants and peacefulness. The unit itself is nothing fancy, but nice nonetheless. The bathroom is large and modern. The galley kitchen is serviceable. The unit could use a little sprucing up and a few reading lamps would be helpful. That said, the place is clean, and has a sweet little porch for reading. It is definitely A OK, and you can't beat the price. I would recommend it to anyone interested. The complex is lovely, very safe and friendly. Access to the remarkable beach is worth the price. Thomas and his wife are great to work with. They took care of everything. Cheers amigos! Thank you so much for the nice review. We sincerely appreciate the time you took to give us this positive review. Hope to see you back very soon. Thomas & Yojaira. Very Tranquil--2 months in Paradise!!!!! 2 months. The manager Thomas & his wife Yojaira are wonderful! We would highly recommend this property! For peace and tranquility this is it! We hope to return next year. Thank you Thomas & Yojaira!!!! All the best to you both! I am a senior woman who visited this condo in November with my daughter. It was my first experience of being in the DR and staying in this lovely ground floor unit with all the amenities of home. While I did travel to nearby Cabarete, Sosua and Puerto Plata I spent most of my time at the condo and the area around it. Being a nature lover I especially enjoyed the tropical plants and trees surrounding the condo. Lying by the pool every day was like being in a tropical garden with birds singing and butterflies fluttering by. I spent many hours just walking along the sandy beach and watching the majesty of the ocean waves. Most evenings were spent sitting on the patio looking out over the pool and lighted gardens listening to the waves……..so serene. This location offers the best of both worlds, you can be as active as you like or as quiet. I took advantage of both and will definitely be returning to this condo for another vacation soon. Cost for electr. will be charged separately and a deposit will be asked for. The cost for electr. depends on the usage of the A/C. If you don't need it the power will cost you US$ 1.-- to 1.50 per day but if you have it running much it can be more.